This is a pretty simple looking image I guess, but thats part of my style I like things to look like they were ment to be together. More work went into it than it looks like. Hmm, the image is kinda grainy... maybe it needs to be alittle more clean, but definitely a good wallpaper! Very nicely done! The image is still abit grainy like the others said but I think it's a great looking wall! I like the background and Edward looks really good here! very good bg and the scan really matches!! its a good job for me! wow ed is so kawai on that. i love it a lot . That is a really awsome wallpaper! I mean its really really awsome! Great job! Definatly going to use it on my desktop! Its good, a little too simple, but its still good! I like it ^_^ it looks good, and its a guy!!! The shadowing is great, good job! fav! Cool. I think you did a great job, it doesn't even look like the image in the backround is a screencap. This wallpaper is very well put together. I like this wallpaper. Edward elric is a very interesting character. Keep up the good work. good job :) it is a tad simple but after reading what you put into it....great job. I didn't even notice that you made the boot and such yourself. Wonderful job. 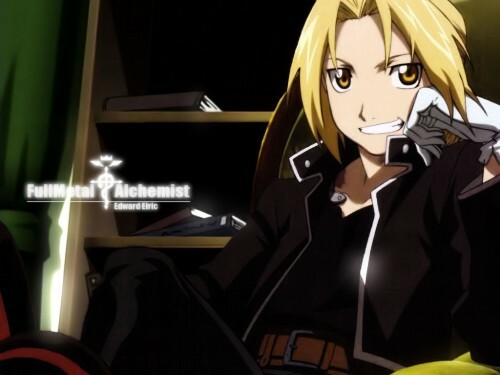 Edward is so cute when he smiles ^_^!! i love this wallpaper, it lloks really awesome! I love your simplistic style. And you did a good job fixing up the picture. this is a really good picture... i love everything about it... haha awesome work!